A few weeks ago, I bought an old cookbook from the ’70s at a flea market and found several recipes tucked inside it that had been clipped from newspapers and magazines. And there was an old recipe card, too–for Chocolate Syrup Brownies. Since I already had some chocolate syrup in my fridge, I decided these brownies would be the perfect recipe to try out first. There was a little note on the recipe card that said these brownies had a mild chocolate flavor, so I thought I’d up the chocolate flavor a bit by adding some mini semi-sweet chocolate chips to the batter. I was really happy with the way these brownies turned out! They’re so yummy and really easy to make–just stir them up in a bowl, pour in a pan, and bake. They are more cake-like than fudgy, but they are also very moist and the chocolate chips give them a rich chocolate flavor. Next time you have a craving for brownies, this would be a great recipe to try! Preheat oven to 350˚F. Grease and lightly flour a 9″ square pan, or line with parchment paper; set aside. In large bowl, cream butter and sugar until smooth; add eggs and blend until very creamy. Add a dash of salt to the mixture. Stir in flour, mixing to blend well. Add chocolate syrup and vanilla, blending well, then stir in the chopped nuts and mini chocolate chips. Pour batter into prepared 9″ square pan, smoothing batter evenly in pan. Bake at 350˚F for 32 minutes, or until toothpick inserted in center comes out clean. Cool in pan on wire rack (loosen edges before brownies cool to avoid sticking–if using parchment paper, you don’t need to do this). Have you made brownies with chocolate syrup? Linked to Fiesta Friday, Sunday Features, Simply Sundays, Nifty Thrifty Sunday, Inspire Me Monday, Making Memories Monday, Show and Share, Wonderful Wednesday, Wow Me Wednesday, Whimsy Wednesday, Wow Us Wednesdays, Wake Up Wednesday, Create It Thursday, Share Your Style, Full Plate Thursday, Inspiration Thursday, Thursday Favorite Things, Showcase Your Talent Thursday, Fabulous Foodie Friday, Feathered Nest Friday. This entry was posted in Cookies/Bars/Brownies, Food and Recipes and tagged Chocolate Syrup Brownies, dessert, Hershey's Chocolate Syrup, mini chocolate chips on October 23, 2015 by nancyc. It’s been a while since I’ve made scones. I think the last ones I made were Blackberry Scones, and that was about a year ago. 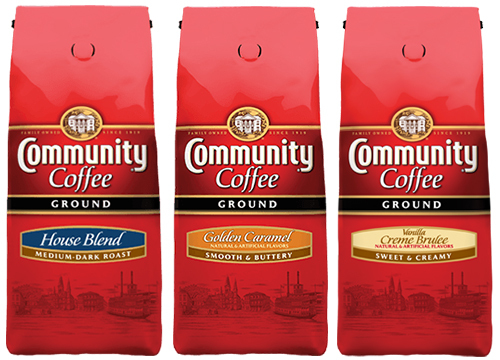 So when I had the chance recently to try some different coffee blends, compliments of Community Coffee, I thought of making scones because they go great with coffee in the morning. And I decided it would be fun to try making some coffee-flavored scones. I envisioned them with some chocolate chips and toffee, too–those flavors are always good with coffee. These scones are more cake-like than biscuit-like. They’re more dessert-like than breakfast-like. But if you like having dessert for breakfast, then you’ll especially like these! 🙂 Everyone who tasted these scones really liked them, so I think you will, too. This scone recipe calls for 1/4 cup very strong coffee (plus 2 more Tablespoons for the glaze). I used the Golden Caramel Blend, but any of these other blends (House Blend, Creme Brûlée) would work well in this. And just a little note–as these scones were baking, they were looking a little puffy, which worried me a little when I took them out of the oven. But as they cooled, they settled down nicely. So don’t be alarmed if you notice some puffiness when you take them out of the oven! Preheat oven to 400˚F. Line a large baking sheet with parchment paper. In medium-size bowl, mix flour, sugar, baking powder, baking soda, and salt. Use pastry cutter to blend butter into flour mixture; mixture will be crumbly . Stir in mini chocolate chips and toffee bits. In small bowl, mix plain Greek yogurt, coffee, and egg until smooth. Blend yogurt mixture into the flour mixture, stirring until clumps of dough form (dough will be a little sticky). Sprinkle some flour over the dough in the bowl to make it less sticky, and with floured hands, knead a few times and shape dough into a ball. Place dough on your parchment-lined baking sheet and pat into an 8-inch circle, about 3/4-inch thick. Use a knife to score into 8 wedges, then bake at 400˚F on your center oven rack for 17-18 minutes, until golden. Note: If you bake these less than 17 minutes, your scones may be under-baked in the middle. Also, the scones may look a little puffy, but they will settle down as they cool. Cool scones for about 20 minutes (or you can cool them completely), then top with the Coffee Glaze. To make glaze, put powdered sugar in a small bowl, then add the coffee and Half & Half (light cream) and stir until ingredients are well blended. Drizzle over cooled scones-you can drizzle as little or as much as you like (you’ll probably have some extra glaze left over). Then lightly sprinkle some additional mini chocolate chips and toffee bits over the glaze. Let glaze set, then cut into wedges where scored, and serve. 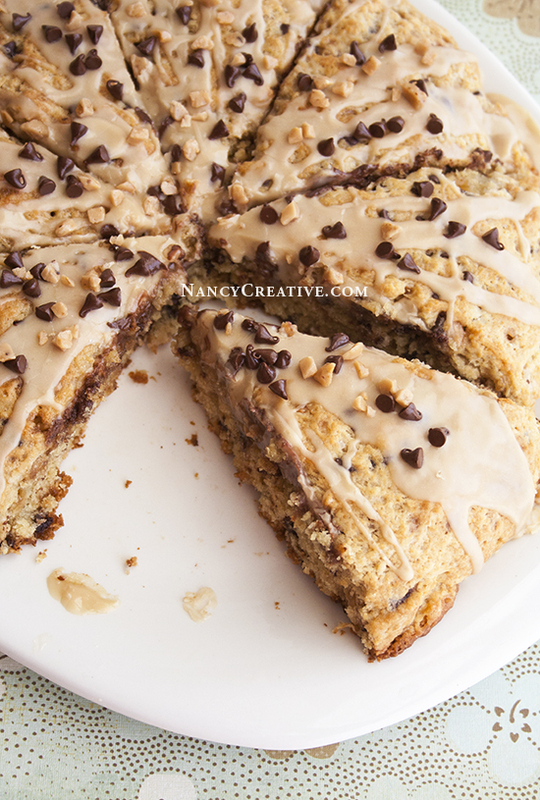 Coffee and coffee-flavored scones are a great way to start the day! This was the first time I’ve used coffee as an ingredient in a recipe. Have you made any recipes with coffee? Linked to Fiesta Friday, Inspire Me Monday, Show and Share, Wow Us Wednesday, Wake Up Wednesday, Full Plate Thursday, Inspiration Thursday, Thursday Favorite Things, Let’s Get Real Friday, Weekend Potluck, Simply Sundays, Sunday Features, Nifty Thrifty Sundays, Making Memories Monday, Saturday Soiree. 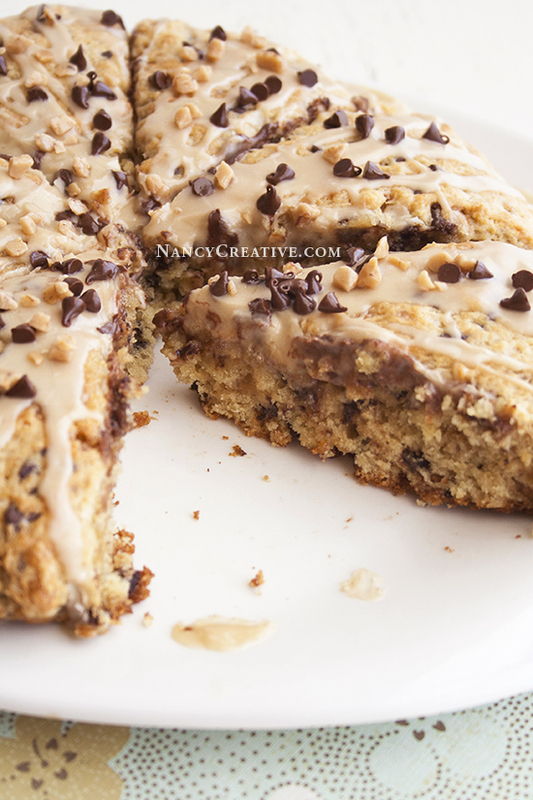 This entry was posted in Breakfast/Brunch, Food and Recipes and tagged coffee, mini chocolate chips, Scones, toffee bits on July 31, 2015 by nancyc. I realized that it’s been awhile since I made anything with chocolate in it, so I thought it would be a great time to make some Chocolate Chip Muffins! 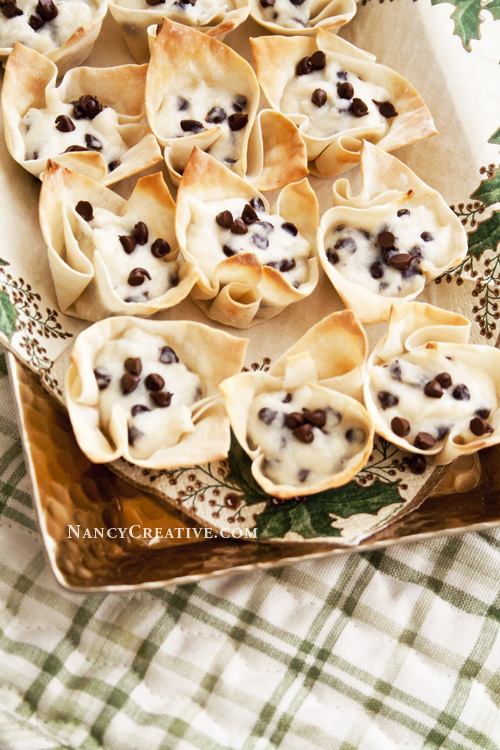 These are nice and cake-y, with lots of chocolate chips in every bite! In fact, it’s so chocolatey, you don’t need a glaze on this muffin because it’s plenty sweet all on its own. The muffin tops do brown around the edges, as you can see in the photo–so be sure not to over-bake, or the whole muffin top will get brown as well and the muffins will be on the dry side. If you like chocolate for breakfast or brunch, these are perfect…and they make a great afternoon snack, too! Preheat oven to 375˚F. Line 2 standard-size muffin pans with 21 paper liners; set aside. In large bowl, blend flour, granulated sugar, brown sugar, baking powder, baking soda, and salt. In medium bowl, mix oil, eggs, milk or light cream (Half & Half), and vanilla, blending well. Blend in the Greek yogurt, mixing well. Pour liquid mixture into flour/sugar mixture and mix until just combined–do not overmix! 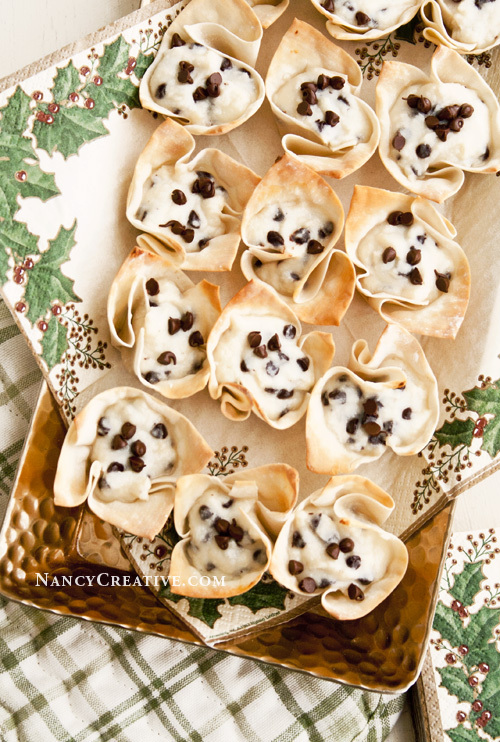 Fold in the chocolate chips, blending evenly into the batter. Spoon batter into the lined muffin cups, filling slightly more than 3/4 full. Bake at 375˚F for 16 to 17 minutes, until a toothpick inserted in center comes out clean. Let muffins cool in pan for 5 minutes, then remove to a wire rack to cool completely (or go ahead and eat them warm!). Now that the weather has cooled off a little, I’ve been enjoying doing more baking. What have you been baking lately? This entry was posted in Breakfast/Brunch, Food and Recipes, Muffins, Biscuits, Scones and tagged baking, chocolate chip muffins, featured, Greek yogurt, mini chocolate chips, muffins, semi-sweet chocolate chips on September 26, 2014 by nancyc.